Typically, a relatively small publishing company doesn’t also own and operate a commercial dairy farm, or any other kind of farm for that matter. But, such is the case at the W.D. Hoard & Sons Company, publisher of Hay & Forage Grower. How the Hoard’s Dairyman Farm got its start has a lot to do with forage, specifically alfalfa. In some respects, Hay & Forage Grower and eHay Weekly bring the company back to its foundational roots, which actually started with alfalfa roots. It was the late 1800s and alfalfa was still trying to gain acceptance by farmers in the Midwest. Sure, Wendelin Grimm had introduced the species in the late 1850s in Carver County, Minn., but as with any new crop venture, acceptance of the new is slow and the management learning curve is high. In Wisconsin, not even the agricultural specialists at the state’s university were recommending alfalfa; lack of persistence just wasn’t worth the gamble. Enter W.D. Hoard, a former Wisconsin governor and current newspaper and dairy magazine publisher. He had seen value in alfalfa for growing and wanted to prove its worth as a feedstuff. Just writing about it wasn’t good enough. As the story goes, Hoard was driving down a gravel road and noticed some alfalfa plants growing in the corner of the fence line along the road. A failed attempt to grow alfalfa in the adjacent field had occurred some years earlier. He surmised that these plants likely had superior genetics or were being aided by the lime dust coming from the road — perhaps both. 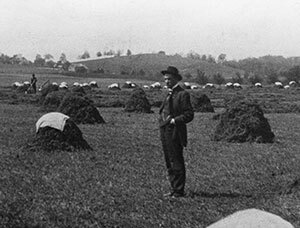 Hoard dug out about 100 roots to replant, but with no farm to plant them he began his alfalfa enterprise on an empty city lot near his home. He nursed and experimented with his alfalfa until convinced that it would thrive in Wisconsin and not lose productivity during the heat of summer; such was not the case for timothy and red clover, both common feeds at that time. To prove alfalfa’s worth to both farmers and university experts, Hoard bought a run down farm just north of his hometown of Fort Atkinson, Wis., in 1899. He successfully established eight acres of alfalfa and talked about the crop at every opportunity. It was the beginning of widespread alfalfa use in the state . . . it was also the beginning of the Hoard’s Dairyman Farm. Today, the farm is a striking contrast between old and new. The original farmstead, listed on the National Register of Historic Places, sits near the road. Just to the east of original farm buildings are a milking parlor and freestall barn, which were constructed in 2007. The facility also includes a visitor center and meeting room. Cows are milked three times per day. Just over half of the herd is Jerseys, while the balance are Guernseys. The milking herd is fed a total mixed ration (TMR) twice per day. Dry cows and young stock are housed at separate locations away from the main farm. Currently, about 900 acres of owned and rented cropland are dedicated to growing alfalfa (300 acres) and corn (575 acres for silage and grain). Custom operators are employed to accomplish all of the field activities from planting to harvest. Both alfalfa and corn silage are stored in bags that sit on a gravel base. Alfalfa is generally cut four times per growing season with the last accomplished in late August or early September depending on the year. Average dry matter yield was in excess of 6 tons per acre in 2014. From time to time, we discuss what’s happening on the farm in our email newsletter, eHay Weekly. If you’d like to read more about the specifics of the dairy operation, the farm’s website can be found at www.hoards.com/farm. The freestall barn and milking center at the Hoard’s Dairyman Farm. Both were built in 2007. To feed the dairy herd, the farm grows 300 acres of alfalfa and 575 acres of corn, which is mostly harvested for silage. This article appeared in the August/September issue of Hay & Forage Grower on page 24.